We've all had those sewing projects that we hate to walk away from. The ones that we just can't wait to get back to work on again -- we think about them when we're cooking dinner or shopping for groceries, or even when sitting at our day jobs trying to pay attention in a meeting. We dream about them and get up a little early in the morning or run home at lunch to steal a few minutes in front of the sewing machine. That's exactly what "The Slankie*" has become for me. Although it took me quite some time to bring myself to start it, once underway, I used every spare minute available to me to work on it because the thought of that blue fuzz floating around the house and sticking to my clothes was unbearable. I dreamed of the day that I could drag out the vacuum to clean it all up and put this messy pile of fleece behind me. I have to admit that the project became more palatable as I seamed the raw edges and hid them under the lining. I have made several small projects using the Minky Dimple Dots and do not recall being bothered by the extra lint. Maybe it's just this particular variety of Minky. Seeing the joy on my daughter's face when I draped it on her made all that mess almost worthwhile. Okay, completely worthwhile. I am looking forward to moving on to my silk blouse, nonetheless. 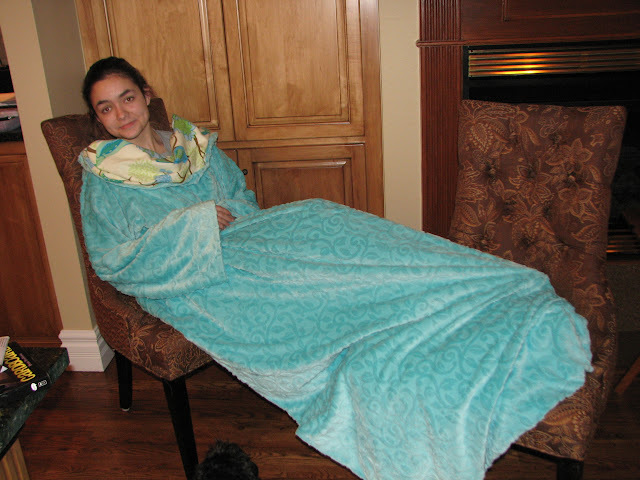 Pattern: Free Snuglet PDF by the genius and generous Wilmoed Sisson, who blogs here. Only one page of instructions with measurements, no ream of paper required. Very simple instructions and easy to follow. 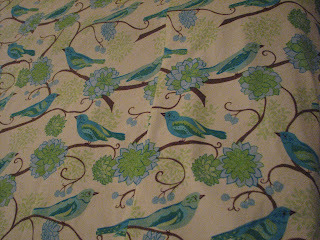 Fabric: Minky Vine Cuddle in Marina (blue/green) as the outer fabric. Since it is a one-sided, lighter-weight fleece, I chose to line it in a coordinating flannel -- Bliss Birds Paisley in Turquoise. The fabrics are cheery colors and I really love the bird print, something about it reminded me of my childhood. Both were from Fabric.com. (1) Since I lined it, there were a few minor/easy adjustments, including sewing the Minky to the flannel and piecing the flannel to get it to a 60" width. (2) I made the overall length (chin-to-toe) slightly shorter than the pattern. At 6'6" it is still long enough to envelope her toes while reclined. Will I make it again? Hmmm...only if someone begs me. The pattern is very simple and it is nice to have an occasional sewing project that doesn't require too much thinking. I'd use a double-sided fleece, or at least not line it with flannel. Although very cute and soft, it added a lot of weight. *I am changing the name of our creation to Slankie. 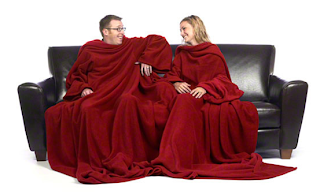 I didn't realize Slanket was a real product -- I thought it was a made-up term that the 30 Rock writers invented. 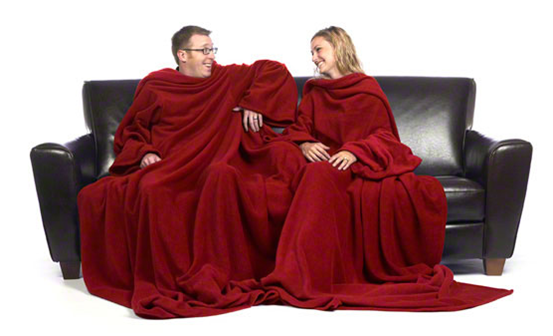 Imagine my surprise when I saw the Siamese Slanket!